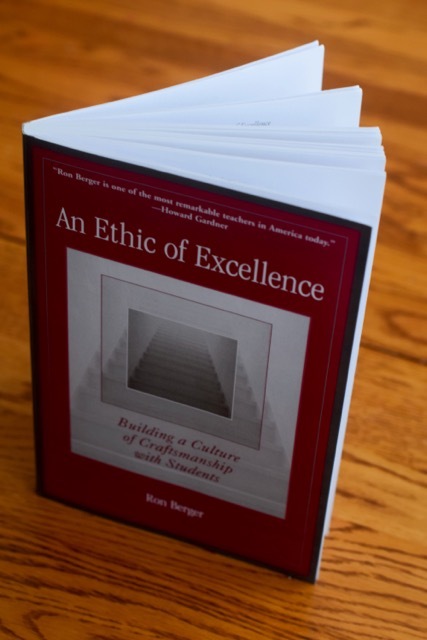 Ron Berger, An Ethic of Excellence: Building a Culture of Craftsmanship with Students (Portsmouth, NH: Heinemann, 2003). Like my last book reflection, I was introduced to this fabulous little book by one of my professors at the University of Alaska Fairbanks (Go Nanooks!). Ron Berger advocates for creating an ethic of excellence in schools that will prompt students to produce quality work. The book is bursting with examples from his own classroom where students were engaged in meaningful projects and produced professional quality work. His students tested well water, measured radon levels, built houses, and replicated unicorn DNA (just kidding about the last one- but the rest of them are for real). Each toolbox gets its own chapter outlining Berger's thoughts and observations from classrooms he's observed across the country. Each chapter reads easily and quickly. I struggle to inspire quality in my students, so this book was sometimes a discouraging read. Berger's impressive student projects seemed unattainable, and I wanted to cry out in defense, "That would never work here!" One of the significant differences between Berger's classroom and my classroom is access to resources. He writes about taking field trips and inviting experts into his classroom. That's simply not an option for me without raising thousands of dollars in plane fare. I can make work meaningful. There are so many real things we could be doing, I don't need to spend class time on worksheets or assignments that get turned in and then thrown away. I can think bigger and use culminating projects instead of isolated daily tasks. Multiple drafts are the norm in Berger's classroom. Each students gathers feedback on each draft and goes back to make revisions. An amazing example of student drafts is Austin's Butterfly. I feel hope when I see the original draft of the butterfly. If Austin can get from the first draft to the final draft through a series of critiques and revisions, my students can do it too! Berger trained his students to be kind, specific and helpful when giving feedback. That's a good starting point for me and my students. How cool would it be if I exposed them to examples of "good" and "bad" feedback and we practiced classifying the feedback? Then we could move on to getting and receiving peering feedback and producing (hopefully) improved drafts. Once I fought through the discomfort of comparing my own classroom to Berger's classroom, An Ethic of Excellence was very inspiring. It's helping me shift my mindset to one that favors project-based learning and authentic tasks. I'm not sure where this shift will take me, but it's one I'm glad I'm making.